A first goal for the club by Gareth Evans was enough to give Southam United all three points in this bank holiday derby at a damp Townsend Meadow, writes David Hucker. 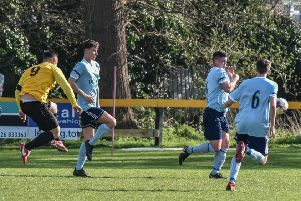 Racing Club came into the match on the back of two impressive away wins but it was the visitors who had the first chance in the seventh minute when a long ball from Josh Smith found Kyle Turner, who shot unchallenged wide of Conal Dowling’s goal. A Chris Bright shot was just touched away by Dowling in the tenth minute and then Evans set Turner away down the right to cut inside Ash Buswell before pulling the ball back, but just out of reach of Dan Ludlow. Lee Thomas came on for Ludlow, who has been carrying a knock for a couple of matches, and the Saints substitute combined with Gaz Walker to set up Evans, who turned and shot, beating Dowling low down at his left-hand post to give Saints a 19th-minute lead. Charlie Neale came to Saints rescue when clearing for a corner before Racing Club had a free-kick in a promising position that came to nothing. The lively Thomas set up Evans again, but this time his chip shot went over the bar, while Saints keeper Tom Cross made a good one-handed save to deny Jake Brown from 25 yards. Four minutes before half-time, Cross cleared a corner, only for the ball to fall to Chris Heydon, but he could not get it under control, sending his shot high over the bar. A dazzling run by Turner in the 64th minute carried the Saints striker past several defenders, but he could not apply the finish. Jack Brighton came on for Josh Smith, slotting into midfield with Bright dropping back into defence, and he soon made an impact, producing a shot from a corner that was palmed away by Dowling. Racing Club were still dangerous and Cross had to be alert, saving with his legs from Chris Dusabe in the 73rd minute. He then tipped another shot over the bar three minutes later before making his third save in quick succession to keep the home side at bay. A good run by Thomas ended with a shot straight at Dowling before Cross had to palm an awkward effort from substitute Junior Bennett away for a corner. In a final flurry, Turner failed to take advantage of a poor back pass and Racing Club forced a corner that came to nothing. Tomorrow, both teams have away ties in the FA Vase, with Saints at Wolverhampton Casuals and Racing Club at Ashby Ivanhoe.  Tom Reynolds scored twice as Racing Club claimed a 5-2 win at Heather St Johns on Saturday. Chris Dusabe, Jake Brown and substitute Ross Knight were also on target for the visitors.